5 Awesome Wedding Favors That Your Guests Will Actually Use! Why not give your guests a favor that they will always remember? Send them home with a wedding favor that they can use over and over. We have some great ideas to help you say thank you to your special wedding guests. Choosing the perfect favor to match your wedding theme while getting something your guests will keep after the wedding can be a challenge. We have put together a list of some of our favorite favors that you can share with your family and friends! Send your guests home with something they can enjoy: the perfect blend of coffee! Who doesn't enjoy a nice cup of coffee, especially the morning after celebrating a big event like a wedding? 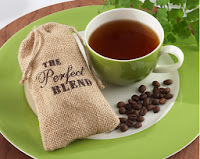 These adorable burlap bags come in a set of 12 and you can fill them with your favorite coffee. Pure, heartwarming country charm is packed into these favors - perfect for the simple, country wedding. 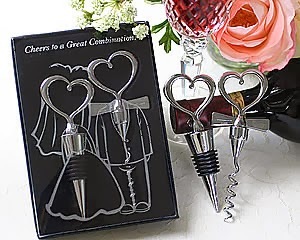 Your guests will remember what a perfect combination you and your spouse make with this matching cork screw and wine bottle stopper set. Every time your guests open a bottle of wine or put it back in the fridge for later, they will remember your beautiful wedding they attended. It may even bring back memories of their special day! As the wedding couple, you are a "Perfect Pair." Show your friends and family your appreciation with this beautiful key chain. The pear is a symbol of prosperity and good health, making it the perfect complement to your wedding. Any time your guests start their car or unlock their front door, they will see this special keepsake you gave them. 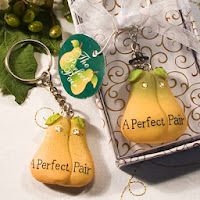 The pair of pears will be a great addition to their set of keys! 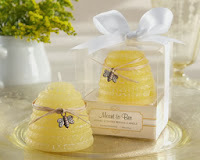 These candles are "Meant to Bee" in your guests' hands! With these intoxicating honey-scented candles, your guests will always remember that you and your spouse are "Meant to Bee". An upgrade from the traditional tea lights that you would find on the tables of many weddings, these bee hive shaped candles are sure to be the buzz around the reception tables. Your guests will never lose their drink during the reception or once they get home with these Blackboard Coasters! The design is perfect for writing a little note or writing your name on. 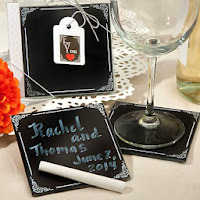 You could even personalize them with each guest's name and a small note instead of using place cards. These coasters serve many purposes - they're not just to set your drink on! The coasters come in sets of two and the white chalk is included. With these interesting favors, your guests are sure to stay entertained and the possibilities are endless! Give your guests a step in the right direction with these adorable wedding favors! 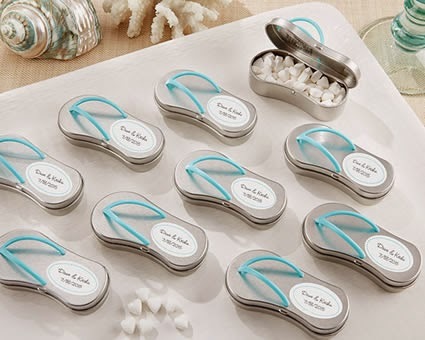 Flip flop mint tins are the perfect favor for any summer or beach wedding! These adorable little gifts not only provide the perfect accessory to spruce up your reception table, they double as a reusable mint tin! You can also add personalized stickers so they can serve as thank you messages, a cute love quote, or even as an alternative to place cards! With these "out of the box" favor ideas, your guests will surely be impressed. These wedding favors are not only eye catching, but will be useful to your guests even after the wedding is over. We hope these ideas make it easier to plan you Big Day! Where brides go® ... for what brides love! Don't forget about our Coupon Code VIPBRIDE which saves you an additional 10% off your entire order at WhereBridesGo.com!! We also offer FREE SHIPPING on all orders over $100 (continental US only). There's no need to be overwhelmed with the thought of planning your big day. Sit down, take a deep breath, grab a cup of tea or a glass of wine and look over our popular 12-month planning guide. Planning a wedding is simply a matter of getting organized. 11-12 Months Before the Wedding Officially announce your engagement online and in your local paper. Decide on a time and date for the wedding. Decide style of ceremony (size, setting, formality, etc.). Contact a wedding officiate. Arrange for your families to meet if they haven't met before. Develop a budget and decide who will pay for what. Begin compiling your guest list. Visit and reserve your reception venue. 9-10 Months Before the Wedding Order your wedding gown and determine who will make any necessary alterations. You've decided to have a military wedding—complete with all the pomp and circumstance such a formal affair entails. Here some tips on planning the wedding of your dreams that still conforms to longstanding military tradition and protocol. The main difference between a military wedding and a civilian wedding is that the bride and/or groom will be in uniform. An officer or enlisted personnel in the bridal party wears uniforms that comply with the formality of the wedding and seasonal uniform regulations. For commissioned officers, the evening or mess dress uniform is equivalent to the civilian black tie. Commissioned officers who elect to wear a sword or saber with their uniform should stand to the left of the bride so as to protect her from the blade. For enlisted personnel, dress blues or Army greens should be worn. Remember, never wear a boutonnière with a military uniform. Military ribbons or medals are the only adornments permitted on the uniform. Whether you are planning a formal dinner reception or an informal gathering of well-wishers, it is important to establish a schedule of events to prevent confusion on the big day! Don't get too hung up on exact times — the idea is to keep the party moving in the right direction. While the order of events is entirely up to you, here's a sample of a traditional reception schedule. This is the time between the wedding ceremony and the reception in which guests are served champagne and hors d’oeuvres while the wedding party is having formal photographs made. Grand Entrance. This signals to everyone that the wedding party has arrived. The traditional order of entrance is Groom's ParentsBride's ParentsFlower Girl and Ring BearerBridesmaids escorted by UshersMaid of Honor escorted by Best ManBride and GroomWedding Couple's First Dance. Your Dream Wedding, Social Media, And You! !